End-Stage Renal Disease - InCube Labs, LLC. End-stage kidney disease (ESRD) occurs when the kidneys completely fail to function properly, meaning that the kidneys function less than 10% of normal and can no longer eliminate waste, concentrate urine or regulate electrolytes. Diabetes most commonly leads to ESRD, and patients often suffer with chronic kidney failure for years before it progresses to this stage. 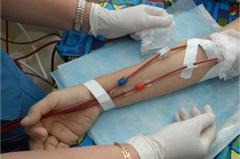 It's estimated that more than 600,000 Americans are on chronic dialysis. There are about 18,000 kidney transplants performed in the US. We are developing a tissue engineered implantable kidney, based on our work in ECM proteins and bioactive membrane.